(Bloomberg) -- Global trade disputes and potential for Brexit- related disruptions continue to affect manufacturing exporters. March data signaled further global declines in new export orders in the manufacturing sector, taking the current trend of declining orders to seven months and reaching the lowest level in almost three years, according to the J.P. Morgan Global Manufacturing Index. 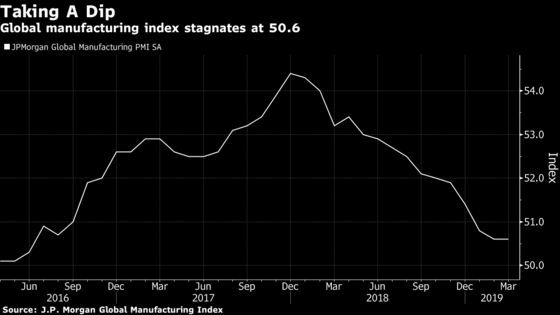 The overall global manufacturing index stagnated at 50.6, the same reading as February, and the slowest pace of growth since June 2016. Manufacturing output declined one tenth of a point, while employment and new orders were unchanged since last month. For the last two months, new orders stagnated at 50.0, a reading that indicates neither an increase in the pace of total new orders nor a decrease. The last time orders failed to show growth was in November 2012. Input prices held in March, after easing almost nine points since last summer, to a two-and-a-half-year low. Meanwhile, the rate of increase in prices factories are charging quickened for the third consecutive month after reaching the slowest pace in a more than two years in December. The global manufacturing firm purchasing index is compiled by IHS Markit and based on the results of manufacturing surveys covering over 10,000 purchasing executives in dozens of countries. These countries represent about 98 percent of global gross domestic with more than half coming from the U.S., Japan, China, Germany, France and the U.K.